The DeTomaso Pantera was first introduced to the public market by the DeTomaso company in 1971, and continued in production until 1996, enjoying an unprecedented 25 years existence. Due to both its prolonged and strong presence on the market, as well as the excellent value for money the Pantera offered its owners , it is the one vehicle that people most often associate with the DeTomaso company. During the 60s, the automobile company Ford needed a new and exciting product which would be able to not only give a real competitive edge over its competitors and rivals Ferrari and Corvette, but also would attract new customers to the declining and somewhat stagnant market shares enjoyed by Ford. After a botched takeover bid of Ferrari by Ford, Ford then decided upon the tactical decision of forming an alliance with DeTomasso, which whilst this was a clever marketing decision, it was hardly a surprising one. DeTomaso had already for some time now relied quite heavily upon Ford fr the production of engines for some of their models and had purchased from Ford blueprints for some of those models. It wasn’t until 1971 that the fruits of this working relationship between DeTomaso and Ford were seen, in 1971 Ford began to systematically import Panteras into the US, however, they were not well received. The quality of the vehicles left a great deal to be desired, with quick rusting, poor handling and a very unsatisfactory finish to the Panteras left a great deal to be desired. The Panteras actually broke down and failed to meet the stringent safety and quality tests imposed by Ford, despite this, Ford went ahead and sold the cars anyway. After much dissatisfaction and grumblings of discontent by consumers, Ford decided that upgrades and modifications were in order and so in 1972 they introduced a number of fundamental alterations to the Pantera, such as A new 4-bolt main Cleveland engine as well as the use of a factory exhaust header. The Cleveland engine was not purely for the consumers benefit however, but rather, had been implemented due to ever increasing government pressure and legislation that sought to control and regulate the emissions given off by cars. Aside from the slight modifications of 1971, Ford done little else to change the basic flaws of the Pantera, there was a parting of ways between DeTomaso and Ford in 1974. In 1975 Ford finally stopped all imports of the vehicle into the US, writing off the vehicle as a failed experiment and in all, selling only a grand total of 5,500 vehicles. 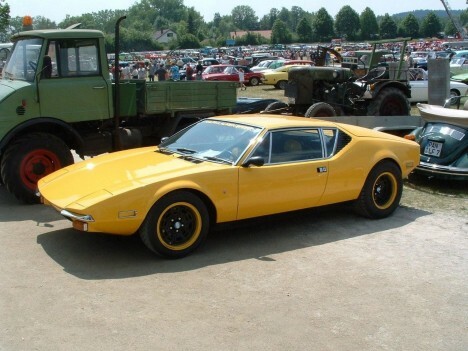 Even though Ford had lost interest in continuing with the Pantera, DeTomaso had not given up just yet on the Pantera and so continued production with the car, steadily evolving the car and making more marked improvements. It wasn’t until 1980 that a new model of any real note was released, and in 1980 the Pantera GT5 was released for sale to the general public, featuring and boasting a number of major changes. There was rocker panel extensions, flared wheel arches, and In 1985, the car was further developed upon by the introduction of the GT5-S. With the introduction of the 1985 model, this heralded a change in both the attitude and production of the DeTomaso company, the cars were no longer a mass produced product, but rather, a high-end, respectable, luxury car that was fully customised and augmented to the customers specifications and really gave the car a strong dominant position. 1989 saw the basic design of the car being yet again revised so as to keep up with the 90s, sadly, the car ceased production by 1993, after a 25 year reign.